While reading the June issue of House Beautiful the other night (which, by the way, is a fantastic issue from cover to cover), I was delighted to read about the Newport home of designer Meg Braff. It's so refreshing to see a house full of color and pattern. The look of the house is traditional and preppy (perfect for a town like Newport) and a bit reminiscent of the late, great Sister Parish. 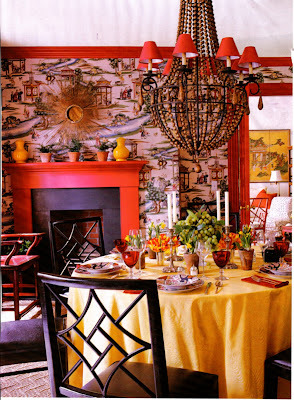 I adore the Scalamandre "Shanghai" wallpaper in the dining room (see above), especially when juxtaposed against the vivid Farrow & Ball "Blazer" painted trim and mantel. 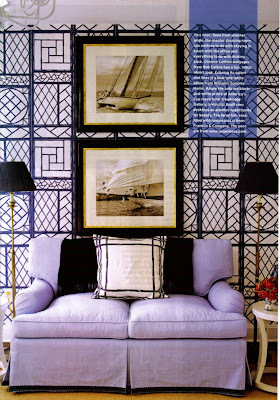 Patterned walls are also found in the library with Farrow & Ball's "Ringwold" in blue , and again in the snappy office with its Bob Collins' bamboo print "Chinese Lattice" wallpaper. 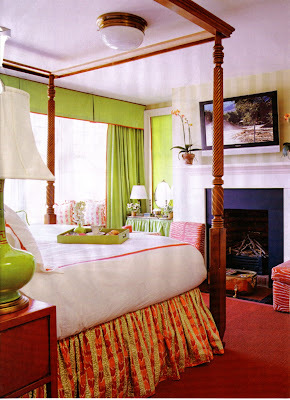 Much of the traditional furniture has been given new life with brightly colored finishes and fabrics. I think what I like most about the house, though, is that there are so many layers to each room that it takes time absorb everything. What an inspiration! Master bedroom- bedskirt in "Bijoux Stripe" by China Seas; animal print on slipper chairs by Brunschwig & Fils. Dressing Room/ Office with Bob Collins' "Chinese Lattice" wallpaper. Love the bottom picture - that wallpaper is devine! Yikes! Typo on Meg's last name....that would be Braff. I still love her work and esp. the Living Room and Sitting Room. Katiedid- Happens to the best of us! I love the living room and sitting room too! You are right about the layers--there is so much to look at in the rooms, but they're definitely not overwhelming, maybe because she coordinates color, pattern, & textures (without being "matchy"). 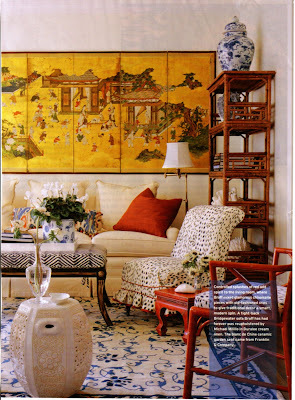 Anyway, I am totally enamored with the "Chinese Lattice" wallpaper too! Nick- In the credits of HB there is a phone number for Bob Collins- (800) 282-9971. The pattern is Chinese Lattice V-1031. The only thing I could find on the web is that they're located in Palm Beach (or could that be another Bob Collins!). Hope this helps. On her website in her portfolio of Palm Beach homes I love the mirrored console table with the shell mirror on top. Any ideas on that mirror? Anonymous- That one is a little unusual in that all of the shells are so small. I'll do some sniffing around and see if I come up with anything! Anonymous- I don't know if you'll see my comment, but I think I found a similar mirror- go to mecoxgardens.com and search for the Atlantis mirror. 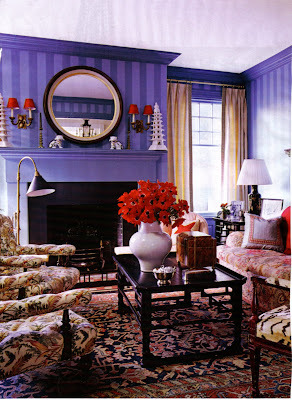 Regarding the master bedroom in the House Beautiful June issue, there is only a peak at what I presume is a secretary. It shows a lovely painted(?) 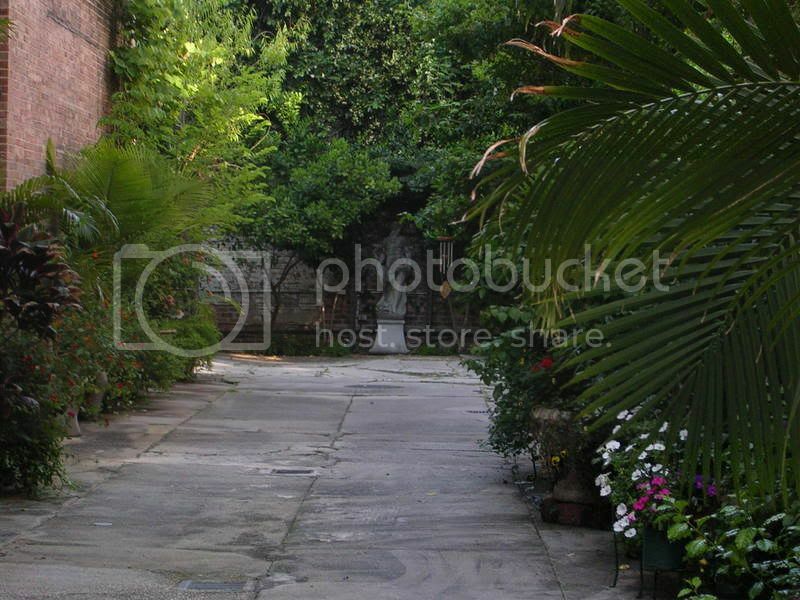 pattern of leaves, grasses, etc. Can you tell me anything about the finish? Thanks. Anonymous- I'll pull out my copy and take a look at it. Will report back later today! Thank you! Does anyone know of a good place on the web to order scalamandre wallpaper at a discount? 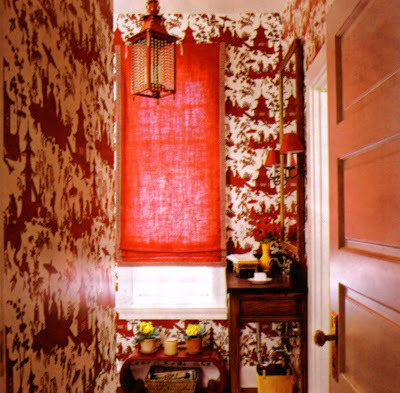 I covet the Shanghai pattern and desperately want to use it in my guest bathroom, but do not want to pay $400 + per roll. Thanks! Anon- There is one online store that comes to mind- Eades Wallpaper. Although, I've never purchased from them before so I can't vouch for their customer service. Or ebay!